I’m not a huge fan of the horror genre. I like the unique ones, but the ones that exist purely for shock and awe are useless to me. 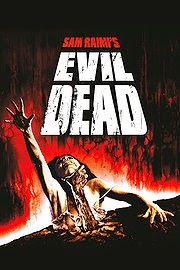 The Evil Dead definitely falls into that category. Don’t let its legacy fool you. Full of bad editing and gore for gore’s sake, this movie borderlines pointless for me. There’s never any surprises, and the characters besides Ash are annoying and never learn from their mistakes. I start off interested but never feel satisfied with the unfolding of events and the unfulfilled plot elements. The movie just drags on and the plot is stretched way too thin. They even attempt to waste time at the end by elongating the deaths of the creatures. Most of the film is either boring or gross. The only time it gets slightly interesting is when Ash is all alone towards the end. I will say that the art was pretty good, especially at the end, but overall the concept is empty and the movie never gives us a reason to worry about the fate of the characters–other than the fact that the music tells us too. I understand that The Evil Dead is supposed to be a cult classic and all, but I just didn’t get any fulfillment out of it, nor a whole lot of laughs. And it leaves me asking the filmmakers why Ash doesn’t get possessed along all with the others.